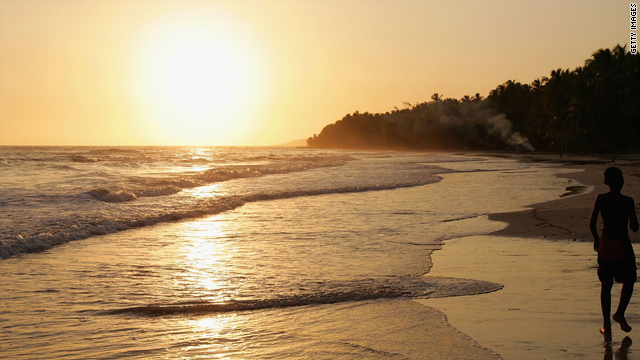 Jacmel, a picturesque town in southern Haiti, has some of the best beaches in the country. (CNN) -- Before last week's earthquake, Haiti was just beginning to capitalize on the weather, location and tropical scenery that have turned many of its Caribbean neighbors into vacation paradises. New hotels, new attention from international investors and buzz among travelers who have visited in recent years seemed to signal a renewed interest in Haiti as a destination. "[Haiti] really is just lovely, and it's a tragedy that they haven't been able to leverage that natural beauty into a tourism industry because it definitely deserves it," said Pauline Frommer, creator of Pauline Frommer's guidebooks, who visited the country during a cruise last fall. Haiti's neighbors in the Caribbean include vacation hot spots like Jamaica, the Turks and Caicos Islands and Puerto Rico. But no glossy brochures tout Haiti's beaches. Instead, news footage of Haitian boat refugees and clashes in the streets of Port-au-Prince, the capital, are the images burned into the public's mind. "When people think of a beach vacation, they don't want to go somewhere where there might be a civil war brewing," Frommer said. It was a different story not that long ago. Just two hours away by plane from Miami, Florida, Haiti had one of the strongest tourist industries in the Caribbean in the 1950s and '60s, according to Americas, the magazine of the Organization of American States. But things went downhill as the political situation deteriorated. "Their regimes have lasted very briefly, there have been coups, military governments have come in, there's been repression. This isn't an inviting environment for tourism," said Allen Wells, a history professor at Bowdoin College. Meanwhile, the Dominican Republic -- Haiti's more stable neighbor on the island of Hispaniola -- began planning and investing in its tourism industry in the 1970s, Wells said, with a big payoff in recent years. Almost 4 million people visited the Dominican Republic in 2008, the most recent date for which annual information is available, according to the Caribbean Tourism Organization. The group did not have figures available for Haiti, but Reuters reported that about 900,000 visitors a year now visit the country, though most arrive on cruise ships for a brief excursion without spending money in resorts and restaurants the way they would at an established vacation destination. Tourism accounted for almost a quarter of the Dominican Republic's gross domestic product -- billions of dollars -- according to the country's Ministry of Tourism. Tapping into that kind of money would be a tremendous benefit to Haiti, the poorest country in the Western Hemisphere, but it would take strong planning and commitment, Wells said. Recent years had brought glimmers of hope for Haiti's fledgling tourism industry. Choice Hotels recently announced it would open two hotels in Jacmel, a picturesque town in southern Haiti. The hotel chain has had no updates on how the earthquake will impact those plans, said David Peikin, senior director of corporate communications for Choice Hotels International. President Clinton, who was named a United Nations special envoy to Haiti last spring, visited the country in October to promote local tourism and told investors it was the right time to make Haiti "an alluring tourist destination." Last year, Haiti also struck a deal with Venezuela to build a second international airport in Cap-Haitien, Haiti's second-largest city, Reuters reported. Lonely Planet has even called Haiti one of the most exciting countries in the world in which to travel. "The visitors who are willing to go and see what's really happening on the ground in Haiti... have been surprised by what they find," said Robert Reid, U.S. travel editor for Lonely Planet. "It doesn't get very good press," he said. "[But] there is more to it under the surface than is often reported outside." Most tourists who have been to Haiti have likely been to the peninsula of Labadee -- about 100 miles from Port-au-Prince -- deposited there for a day of activities by a Royal Caribbean cruise ship. The company has spent $50 million developing the area, making it Haiti's biggest foreign direct investor, said Adam Goldstein, president and CEO of Royal Caribbean International, in an interview with NPR. But critics say Labadee has little to do with local culture. Some people may not even be aware they are in Haiti when they visit what the cruise line touts as "Royal Caribbean's private paradise." Frommer, who spent a day on Labadee during her cruise, said Royal Caribbean staffers were "very, very, very careful" not to refer to it as Haiti, though the company's Web site includes the country name in its list of ports of call. Frommer marveled at the intense natural beauty of the place, including lush jungles and beautiful white sand beaches, but she was also quick to notice the heavy security. "I happened to take the zip line ride, which takes you outside of the compound, and you realize that the entire area of this private part of Haiti is surrounded by barbed wire. It's like a fortress," Frommer said. There were no excursions offered beyond the secured area, she said. The precautions may not be surprising given the longstanding tension in the region. Before the earthquake, the U.S. State Department's travel warning for Haiti urged U.S. citizens to exercise a high degree of caution when visiting the country. "While the overall security situation has improved, political tensions remain, and the potential for politically-motivated violence persists," the department's pre-earthquake warning said. "The absence of an effective police force in many areas of Haiti means that, when protests take place, there is potential for looting, the erection of intermittent roadblocks by armed protestors or by the police, and the possibility of random crime, including kidnapping, carjacking, home invasion, armed robbery and assault." In the wake of the massive earthquake, there are fears any progress made recently by the country's tourism industry could be erased. "I hate to say that it will be a setback, but I can't imagine it not being," Frommer said. But there also was hope that since the quake was localized in Port-au-Prince, other parts of the country could stay on the path of progress. "All the development projects... the tourism, the airport that needs to be built in the northern part of Haiti -- everything else should stay on schedule," Clinton wrote in Time magazine last week. Reid was optimistic that people flocking to Haiti from all over the world to help after the disaster would be moved by its plight and recognize its beauty. "People want to go as responsible travelers and go into a place where their money might be able to make a difference," Reid said.